For its exceptional artistic quality and for its honest depiction of unsettling desire. COMBAT won the TEDDY Jury Award last February at Berlinale. "Combat" is the third and last part of the filmed diary started by Patrick Carpentier in 2003 and entitled "The irreg­ularity of the tearing". Two young men fight with each other. They hit each other very hard. But their fight­ing remains an act of love. There is no prize. There is no winner. There is no pride. A voice-over narrator tells a strange story in which he rediscovers the extent of his desire. Questions arise: does one inflict pain on the other or on oneself? How can we let go in a world in which we are taught not to let ourselves be pushed around? Combat is a dissection of pain, of abandonment. "Filmed diary as a passage from documentary to fic­tion: My first film, a 16mm video-clip shot for the rock band Venus, is the only completely fictional film I ever directed. Since then, all my films have been leaning towards documentary, either experimental or more formal, such as "La peur tue l'amour". For "The irregularity of the tearing", I surprised myself by letting the manufacturing of my films evolve: an exclusive focus on editing with "God is a Dog", built around Super8 images shot well before the produc­tion of the film, and day-to-day shooting directly based on my life's moments for "The 9 Tuesdays". A small part of the collective unconscious, finding its place into my imaginary world. 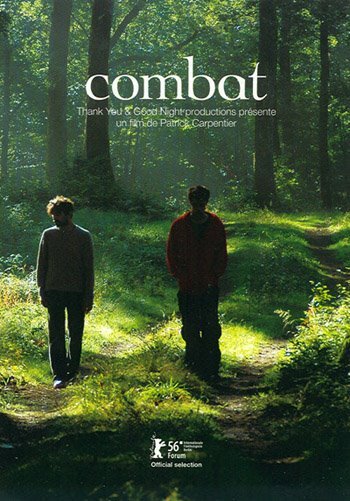 Desire, pain and abandonment: "Combat" is mostly the story of an unexpected encounter that stirred my desire, a merg­er of violence and tenderness. A sensual encounter pushing desire into its last entrenchments."